Easy to use impact printer. Think of impact printers like a typewriter. A print head strikes an ink ribbon, transferring and making an imprint on the paper it strikes. Impact printers are also known as Dot Matrix printers. 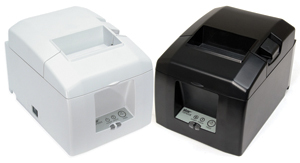 They are perfect for printing in kitchen environments or other areas where heat may restrict the use of a thermal printer. The Epson TM-U220B mPOS version has been specifically configured to work seamlessly with Square. It comes DHCP enabled so that once you’ve connected it to the local area network with an Ethernet cable and power it up, a chit will print out with your network IP address. Now you can follow the instructions to set it to a static address and configure within your Square POS settings so that you are printing in no time. Some of the other benefits of using an impact printer is it allows for two-color printing for highlighting menu modifiers so your kitchen can easily see special instructions for the base item ordered. 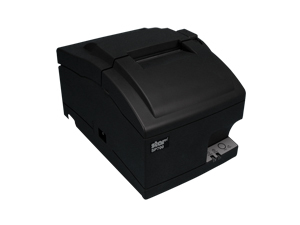 Additionally, impact printers such as this Epson TM-U200B allow you to use carbon copy paper so you can easily have 1, 2 or 3 copies of the same order. You can find additional paper and ribbon options on the consumable category. Other recommended options include the wall bracket and power supply cover for clean cable management, as well as extended & spare in the air warranties in case the standard 2 year limited warranty is not enough. 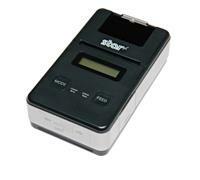 Last but not least the TM-U220B mPOS is also energy star rated to meet energy conservation standards set by energy star. If you want to make your printer more environmentally friendly it also comes ready to take advantage of Epson’s paper savings features for up to 30% paper savings on each print out. Check out our paper savings calculator below for more information on how the savings can really add up.